Did you get your Fee's Shabby Shack Newsletter this morning? 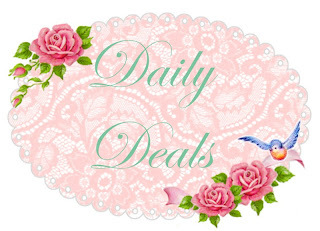 Our first daily deal has been released and our new web site which is still a work in progress has gone live. Every day a new deal will be sent to you - You never know it could be something that you need and will save you some $$$ in an economy where every $ counts. This is going to be so much fun - We can build a quilt together. You get 3 new designs every month delivered to you for just $10.00 per month (Overseas Postage is just $2.00). That is a paper pattern with 3 new designs - applique and stitchery. I have decided to do mine in pastels but it would look great in any colour and I think redwork would be stunning ! And for an additional 5 entries you need to be a facebook follower of Fee's Shabby Shack (The link is on the front page of the web site - www.shabbyshack.com.au). If you are a facebook follower you will be entitled to lots of mini sales throughout the week - Every week. Have fun and have a wonderful week. I will be back to draw the winner on Friday morning. Congratulations on a wonderful venture. I've already ordered some scissors and look forward to each Daily Deal. Please enter me in your lovely giveaway - I am a follower. Woo Hoo opening day! Congratulations Sweetie and I wish you all the success in the world! Lovin those hexies. Congrats and I received my newsletter this morning!! Love to be in to win this fab giveaway! Am already a follower, thanks Michelle. Oh gosh love those hexies! So totally adorable! I am a follower of your blog. Congratulations on your new adventure. I'm sure it will be a success. I am a follower. Congratulations Fee WooHoo how Exciting for You. What a Beautiful Giveaway. Thank You. Congratulations on your new opening! I am a follower and just signed up for the newsletter..I am looking forward to that! What a lovely giveaway and those hexagons are just adorable! Fee, Congratulations on your opening. I have been a follower for some time and have posted on my blog about your give away. I am following you on Facebook as well. Look forward to many more beautiful posts. Fee Congratulations on your new adventure. I love the hexies. I think a quilt made with them would be adorable. I would love to enter your give away, Have a wonderful day. A Missouri Friend. Hi Fee, I love your shabby designs - well the ones I have seen so far! Please enter me in your give away. (I just love these colours!!) I am now a follower and have liked and shared your Facebook page! Good luck with the business venture and I look forward to meeting you in Sydney on the show circuit next year!! Congratulations and I wish you lots of fun and success for your business. I am a happy follower of your blog and thanks so much for the lovely give away! I just liked you on FB (Linda Goulty). Congratulations Fee, or rather lucky us, this looks like it`s going to be fun. Thank you for so many chances to maybe win some shabby prettiness. I already subscribe to your newsletter, and now I am a follower on Facebook. Hi Fee. Best of luck in your new venture! I am a follower of your blog and I now follow you on facebook too. Great giveaway! I am a follower - thanks for the great giveaway! Congratulations and I received the Newsletter this morning. It all looks very new and nice. Hi Fee, I am already a follower and I have also "liked" your facebook page and have also signed up for your newsletter. I am thinking of joining your hexagon club. Thanks for the giveaway. Congratulations on your new venture. It all looks wonderful and I'll look forward to seeing tomorrows mailer too! Congratulations on your new venture and adventure. I hope it is wonderful for you. I am a follower of yours & like both Designs by Fee and Fee's Shabby Shack on Facebook. I have also subscribed to the Fee's Shabby Shack newsletter. Such a lovely give away! I have liked you on F.B. and receive your newsletter. Thanks for the opportunity. Hi. I just found your blog and became a follower. Please enter me in your giveaway. Hi love the designs I am a new follower. What a lovely blog. I've just become your newest follower, and wish you great success in your new endeavor. Thanks for the chance to win such beautiful stash! I am now a follower by newsletter and I liked you on fb! Thank you for the chance to win! I am a new follower! What a lovely site. I have signed up for your newsletter. I found you today when I looked at Jennie of Elefantz's post! love what both of you do. I have liked you on fb as well. Congrats on a lovely site and thanks for the inspiration. Congrats! I also found your new venture through Jenny...thanks for the follow by email option! And of course the giveaway! OH, and I've also liked you on Facebook! More opportunities to see your wonderful designs! Love you here and love you on FB! Hi Fee.. I am now a follower on facebook and of course of your blog. love that craft- it's always inspiring. Happy sewing!